This was the phrase that drove the UP Fighting Maroons back to the elite level of the UAAP. 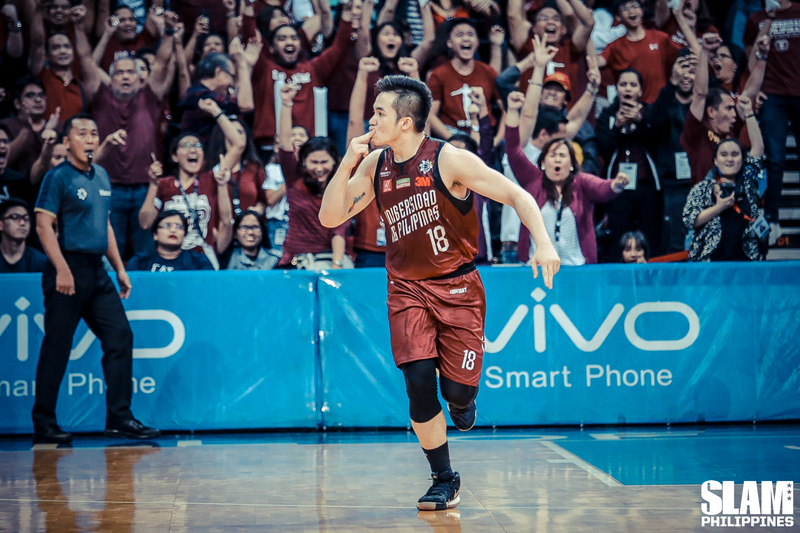 It was the battlecry that catapulted Paul Desiderio to legend status not only in the Diliman, but in the entire UP system. It all began with a promise Desiderio made back in Season 80 that before the end of his collegiate career, he would bring the UP back to the Final Four. By doing so, he hoped that he could start the winning culture on his team before he graduates. However, it seemed as if everyone was looking past Season 81. All the buzz was focused on the arrival of Ricci Rivero and Kobe Paras in Season 82. Why not? After all those years that UP’s roster was mostly filled by relative unknowns and B-listers in high school basketball, they finally signed some of the biggest names in the local hoops scene. One is a proven champion in collegiate basketball with La Salle, the other is a player with a well-documented voyage in the States before finally coming home to play ball. Moreover, UP’s performance in Season 80 wasn’t exactly beaming with greatness. The offense revolved around Desiderio. He chucked up shot after shot after shot, regardless if it was falling or not. It was like a repeat of Kiefer Ravena’s Ateneo in 77 and 78. Unfortunately, Desiderio couldn’t wait for one more year. For him, UP’s time was now. Ever since his Atin ‘to moment, he was focused on keeping his promise of bringing the Fighting Maroons to the Final Four. The arrival of Bright Akhuetie only strengthened Desiderio’s chances of delivering his vow. By all means, he and his teammates would try to break out in Season 81. That’s what they proved in their very first game of the season. The Fighting Maroons used a strong second half to clobber the Red Warriors. It was the perfect announcement from the constant bottom-dwellers of the UAAP: enough with the bonfire, they would contend for the Final Four. It took more than relying on Desiderio when UP asserted its dominance against UE. 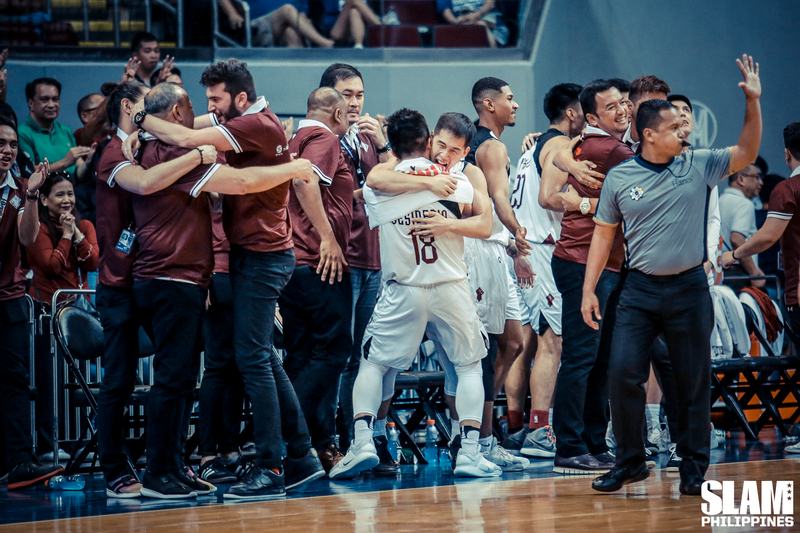 Beyond the 29-point lead, the Fighting Maroons showed that they won’t be relying on a player-centric offense anymore like they did in Season 80. Five players scored in double digits in the game, a far cry from the previous season when it was all Desiderio. In the process, they embraced their new identity: an efficient, fluid offensive team that relied on several people to execute the barrage on all fronts. The five-pronged attack of Juan and Javi Gomez de Liaño, Paul Desiderio, Bright Akhuetie and Jun Manzo would later on give the Fighting Maroons the best averages in points, field goal percentage and assists throughout the league. It became apparent that Desiderio would be willing to take a step back for the benefit of his team. For the first time, Atin ‘to wasn’t just his personal battlecry. It was finally the entire team’s as well. But the season quickly went south for UP. Their lack of depth and pedestrian defense was exposed. 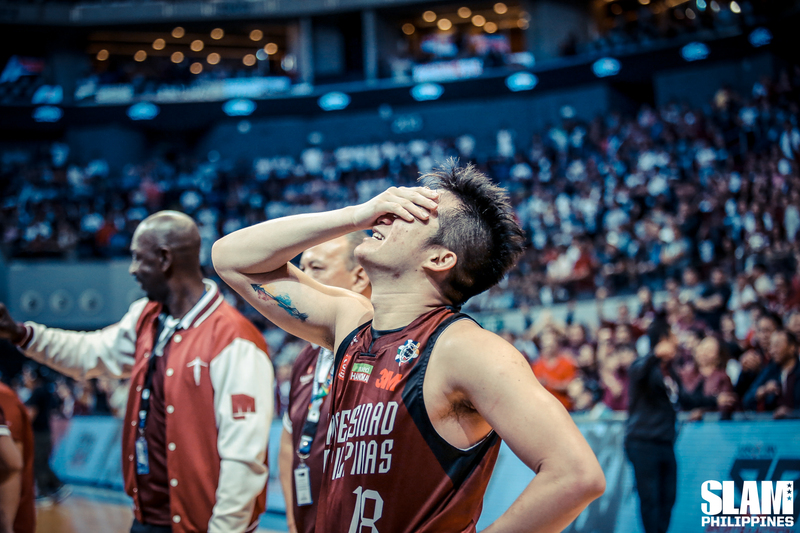 As a result, the Fighting Maroons lost five of their next seven games, and at one point crashed out of the Final Four contention with a 3-5 record. Suddenly, they were back at a familiar territory, outside of the top four, looking in. It was apparent that UP needed to mix things up, which was exactly what Coach Bo Perasol did. In a stroke of brilliance, he brought the younger Gomez De Liano off the bench. For any other team, moving a talented player out of the starting unit might not have been the best option. Any other kid with the talent level of Juan might have flipped out if given the same situation. He proved how good he was this season, why not let him start games? Yet, he followed his coach’s orders without any ifs or buts. Just like how Desiderio took a different role on offense this season, Juan did the necessary sacrifice so they could have a shot at the Final Four. Just like how his captain exemplified #16Strong, the younger GDL chose to put his trust on his teammates and coaches. The move immediately made an impact, as the Fighting Maroons won four of its next five games. It was enough to set a date with destiny—the final elimination round match against La Salle. By that time, the stadium was constantly drenched in seas of maroon. Everyone in the UP community who followed the Fighting Maroons were riding on Desiderio’s Atin ‘to battlecry, so much that it became a movement for the entire university. The whole team and their fans knew what a win over the Green Archers would mean: the first return trip to the Final Four in 21 years. As such, the Fighting Maroons played like it was the last game of their lives. UP unleashed 97 points on 46 percent shooting against a perennial contender. They converted shots from anywhere on their side of the court. It was absolute offensive mastery. And so they booked a ticket back to the Final Four. Their reward? A semifinal series against the Adamson Falcons, the same team that delivered two heartbreaking losses to UP in the elimination round. It didn’t help that this same team also held a twice-to-beat advantage for the match. Perhaps, the Final Four trip only made he Fighting Maroons hungrier than ever. They were out for blood against the Soaring Falcons. Whoever thought that Desiderio and UP were contented with a Final Four stint had it wrong. They came out swinging against the number two team of the UAAP. It was a slugfest. Shot for shot. Stop for stop. Run for run. Both games were close. And in both games, Desiderio had a hand in the clutch to clinch the wins for the Fighting Maroons. In Game 1, it was the step back jumper that put them in the lead before Akhuetie’s game winner. In Game 2, it was the five-point blast in overtime, which included the game-winning jumper over Sean Manganti. It was all utak at puso for Paul Desiderio at those moments. He had the courage to take over, the presence of mind to take the right shot at the right time. 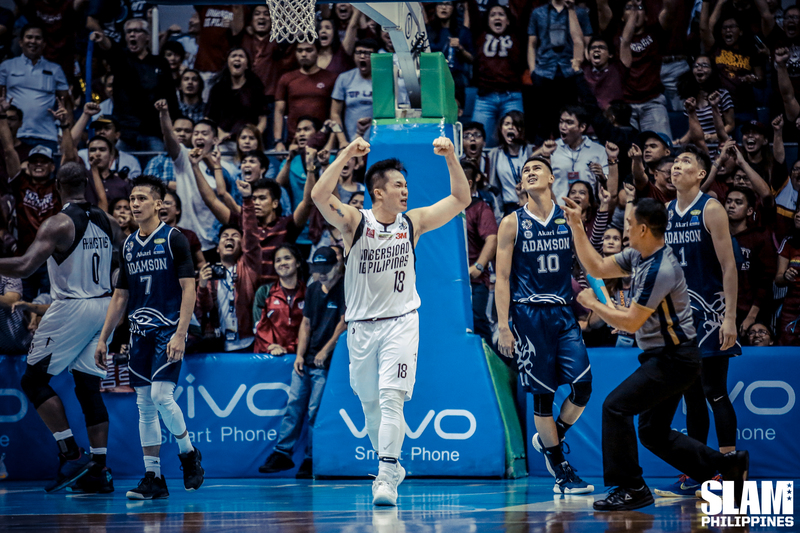 Desiderio not only stayed true to his promise, but he also wrote the greatest Cinderella story that UP, and probably the UAAP, has ever witnessed in recent years. Their journey to the finals was like a script for a Hollywood movie that’s perfectly written by the basketball gods. However, not all fairy tales have a happy ending. At some point, reality will bite back, slap every dreaming soul in the face as if to say that in the end, skills will always matter in this sport. That’s the case for UP. Ateneo turned the finals into their own show. Game 1 might have been closer than expected, but UP had no answers in Game 2 for Thirdy Ravena and the rest of the Blue Eagles. Every rebound, every shot, every play that Ateneo made was executed with relative ease. They were clearly the better team in the finals, the best in the UAAP bar none. They flexed their way to their second straight UAAP title. Was it anticlimactic for UP? Yes, somehow it was. But it didn’t mean that it wasn’t a memorable season for the team. The finals loss didn’t take much away from everything that UP achieved this season. Bright Akhuetie was named the MVP. Juan Gomez de Liaño joined him in the Mythical Five. 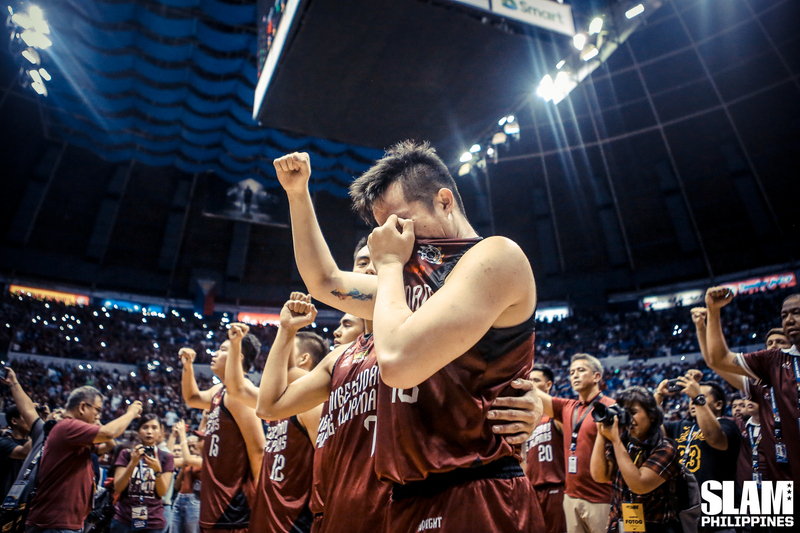 Diego Dario, Gelo Vito and Jarell Lim and JJ Española ended their college careers in a way that was unimaginable for every graduating Fighting Maroon three, five years ago. UP finally entered the Final Four after 21 years, and the finals after 32. For thefirst time in what felt like forever, the stadiums were packed with fans who screamed ‘U-NIBERSIDAD NG PILIPINAS’ at the top of their lungs. Finally, the Fighting Maroons have re-established a winning culture that eluded them for decades. More than just championships, the moments define the greatness of basketball as a sport. Winners will change. They will come and go. They may be forgotten. But stories that captured the hearts of those who witnessed the game will live on for a very long time. That was the story of the Fighting Maroons this season. They defied all odds, exceeded all expectations and were two wins away from the title. Just like how the triumph of the 1986 Fighting Maroons lived on for decades, UP’s success story this year will echo in the corners of all the UP campuses for the years to come. At the center of it all is Paul Desiderio. The man who started a revolution in Diliman. A cult hero. A UP legend who delivered on the promise he made a year ago.